MIAMI — As he was raised in Alabama, Craig Kimbrel was among the countless Braves fans who used to love watching John Smoltz close games. Kimbrel now has the honor of knowing he has saved as many games as Smoltz did during his stint as Atlanta’s closer. Kimbrel matched Smoltz’s franchise record of 154 saves when he closed out Saturday afternoon’s 9-5 win at Marlins Park. It appeared he would have to wait at least one more day to reach this mark. But he was summoned out of the Braves’ bullpen after the Marlins put two on with one out in the ninth. After Kimbrel opened his outing by striking out Derek Dietrich, Ramiro Pena committed an error that loaded the bases. But the 26-year-old Braves closer then ended the game with a Casey McGehee groundout. Smoltz’s stint as Braves closer began late in the 2001 season and extended through ’04. During that span, he converted 154 of 169 save opportunities. Kimbrel has been successful with all but 17 of his 171 save opportunities. Still just 26 years old, Kimbrel is positioned to have many more opportunities and possibly one day approach the records set by Mariano Rivera, Trevor Hoffman and many of the game’s other legendary closers. Eric Gagne (91.7) and Smoltz (91.1) are the only pitchers in Major League history to record at least 150 saves with a save percentage better than Kimbrel (90.1). As he neared John Smoltz’s Braves career record for saves, closer Craig Kimbrel tried to put things into perspective by noting that Smoltz only served as closer for 3-1/2 seasons of a distinguished 21-year career. But the fact remained, what Kimbrel has done is nonetheless impressive and historically dominant. Kimbrel, in his fourth season as closer, entered Sunday needing two saves to match Smoltz’s Braves record of 154. Kimbrel considered it an honor. “It definitely is,” he said. “(Smoltz is) a man I looked up to when I was younger, and still look up to. The things he was able to do in the game of baseball, not only as a closer but as a starter — and to do it as long as he did it, that’s impressive. Nearing a record that he has is pretty special, but he only (served as closer) for four years. Smoltz is the only pitcher in major league history to have many as 200 wins and 150 saves. He closed for 3-1/2 seasons after returning from Tommy John elbow surgery, and in his three full seasons as closer he had save totals of 55 in 2002 (still the franchise record), 45 in 2003 and 44 in 2004. Kimbrel last season became the second Brave to have a 50-save season and youngest (25) in major league history to do it, notching a career-best 50 while leading the National League in saves and ERA (1.21). He finished fourth in the NL Cy Young Award balloting. This season he had 13 saves and a 1.96 ERA in 19 appearances before Sunday, and already racked up 36 strikeouts with seven walks in 18 1/3 innings. His 17.7 strikeouts per nine innings was more than 1 ½ strikeouts higher than the next-highest rate among major league pitchers. In February the Braves signed Kimbrel to a four-year, $42 million extension with a fifth-year option, an unusually large and lengthy contract for closers at a time when the industry trend has been toward shorter deals for what is viewed as the most precarious of major league jobs. The deal was an obvious indication of how highly the Braves think of Kimbrel, widely viewed as the best in baseball at what he does. Given his contract, Kimbrel said if he didn’t set the Braves career saves record, “then something’s wrong.” At the same time, he doesn’t take anything for granted. The Alabama native’s 89.9 career save percentage rate ranked third in history among closers with at least 150 saves, behind Eric Gagne (91.7) and Smoltz (91.1). Kimbrel has led or tied for the NL lead in saves in each of his first three seasons as closer, and in 2012 he was the first pitcher in baseball’s live-ball era to strike out 50 percent of the batters he faced, fanning 116 of 231. He was the 2011 NL Rookie of the Year after leading all major league relievers with 127 strikeouts. He has struck out a remarkable 44 percent of the batters he’s faced in his career, which makes Kimbrel the runaway leader in that category among closers with 150 or more saves. Next on the list: Billy Wagner, a one-time Brave who struck out 33 percent of the batters he faced in a career that included 422 saves and 1,196 strikeouts. Kimbrel struck out all three Colorado batters he faced in the ninth inning Friday in his 13th save of the season, after striking out three in a row following a leadoff hit-by-pitch Thursday against the Rockies. As Craig Kimbrel sauntered through the Braves clubhouse late Monday afternoon, he said he had not yet been presented with the baseball he threw to record his 150th career save on Sunday. But at the same time, he did not seem too concerned. “I don’t look at it like it’s going to be my last,” Kimbrel said. According to STATS, Kimbrel became the youngest pitcher (25 years and 355 days) to record 150 saves, and he did so in the fourth-fewest amount of save opportunities (167). The three pitchers who needed fewer opportunities were Eric Gagne (156), John Smoltz (163) and Joe Nathan (166). Having had the unique opportunity to serve as a full-time closer throughout his rookie season, Kimbrel reached the mark in fewer career appearances (248) than any pitcher in Major League history. Kimbrel entered Monday four saves shy of tying Smoltz’s franchise record. Smoltz notched his 154th and final save for the Braves in his 168th opportunity on Oct. 2, 2004. PHILADELPHIA — When David Carpenter entered Monday night’s game to serve as the Braves’ closer against the Phillies, the obvious question was, Where’s Craig Kimbrel? So after the Braves’ wild, 9-6 win, Kimbrel, who has been around long enough to know what was coming, looked back from his locker and laughed. Kimbrel was given the night off after experiencing some soreness in his shoulder on Saturday night after he picked up his fifth save in as many chances this season in a win over the Nationals. The Braves are being careful with their most valuable bullpen piece, which is understandable, but they didn’t appear overly concerned, saying that a day or two of rest is all that’s needed. “He has a sore shoulder,” manager Fredi Gonzalez said. “We’re going day to day with him. LAKE BUENA VISTA, Fla. — Craig Kimbrel no longer has to worry about the arbitration process. More importantly, the Braves have positioned themselves to not have to worry about who is going to handle their closing duties over the next four seasons. The Braves have signed Kimbrel to a four-year, $42 million contract that includes a $13 million option for the 2018 season. If the option is exercised and all of the potential bonuses are earned, the package has a maximum value of $58.5 million. Kimbrel’s contract is the largest ever given to a closer who has not yet become a free agent. It also provides him the largest guarantee and average annual value ever given to any first-year arbitration-eligible pitcher. 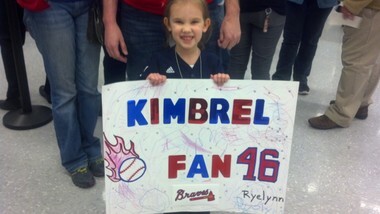 “I’m very excited,” Kimbrel said. “This is where I wanted to be. I’m glad we were able to come to terms and get this done. The Braves announced the deal on Sunday morning, approximately 24 hours before they had been scheduled to go to an arbitration hearing that would have determined whether Kimbrel’s 2014 salary would be the team’s offer of $6.55 million or his request of $9 million. Kimbrel is guaranteed an average salary of $10.5 million over the next four years. If the maximum value is realized, he’ll earn an average of $11.7 million over the next five years. Through his first three seasons as Atlanta’s closer, Kimbrel has managed to exceed the lofty expectations he produced during his successful Minor League days, when he was known as “the right-handed Billy Wagner.” In the 210 appearances he has made since the start of the 2011 season, Kimbrel has converted 138 of 153 save opportunities, produced a 1.48 ERA and struck out 42.9 percent of the batters he has faced. No other Major League closer has converted more than 110 saves during this span. While becoming the youngest pitcher to ever record a 50-save season in 2013, Kimbrel also became the first closer in Major League history to record 40-plus saves in each of his first three full seasons. If Kimbrel extends his recent trend, which has allowed him to draw comparisons to the likes of Wagner and Mariano Rivera, this has the potential to be a team-friendly deal. Had Kimbrel lost Monday’s scheduled hearing and then extended his recent success this upcoming season, he would have been in line to gain a salary between $10-11 million in 2015, which would have been the second of three potential arbitration-eligible seasons. In the event that Kimbrel would have won this year’s hearing, there would have been reason to wonder if the if the Braves would have to trade him at the end of this upcoming season to delete the risk of him proving to be too expensive during his final two arbitration-eligible seasons. But after Kimbrel’s agent, David Meter, got the negotiations rolling again last week, it became apparent that the Braves did not want to lose an elite closer, and Kimbrel did not want to say goodbye to a team that he has dreamed of playing for dating back to his childhood days in Huntsville, Ala.
With this agreement, the Braves have taken another major step in their comprehensive plan to keep a solid portion of their talented young core together in preparation of the opening of their new stadium in 2017. Over the past two weeks, the organization has committed more than $220 million with extensions given to Freddie Freeman, Jason Heyward, Julio Teheran and Kimbrel. Kimbrel said the decisions to make the previous commitments to the aforementioned players only increased his desire to stay in Atlanta. MADISON, Alabama – Funny thing about celebrity. The best relief pitcher in the National League has been in this very store two or three times this off-season, with nary a bit of hubbub. Indeed, it may be part of the player’s appeal, his unassuming persona, the ability to blend in and be lifesized, even as he toils in a world that’s larger than life. Yet when it is announced that Craig Kimbrel would be here, in this Academy Sports and Outdoors store, to sign autographs as part of the Atlanta Braves annual caravan instead of merely as an anonymous customer, hundreds, maybe even into four-digits, line up inside. Brown was on her way from her home in Montgomery and headed to Nashville anyway, so it was a convenient stopover. She was the first person to collect autographs as, from right to left, Braves rookie catcher Christian Bethancourt, pitching prospect Gus Schlosser, Kimbrel and pitching prospect Aaron Northcraft, signed at a long table near the store’s entrance. Brown describes herself as “a baseball fan in general” more than merely a Braves fan. Kimbrel makes another caravan stop in Georgia on Monday, then he’s basically back on the clock. He reports to Atlanta for “Camp Roger” – that’s the preseason “voluntary” mini-camp for pitchers under coach Roger McDowell – then it’s on to Orlando for spring training. The 25-year-old, who played high school ball for Butch Weaver at Lee, then pitched for Wallace State-Hanceville, has led the National League in saves each of his three seasons and been chosen for the All-Star Game each year. He has a career 1.39 ERAin 231 relief appearances, with 139 saves and 381 strikeouts in 227 innings. As the closer, called upon in the ninth inning to hold a lead, there is enormous pressure. It has been a relatively low-key winter, Kimbrel said. As he heads to spring training, there is an enormous difference from a year ago. He was invited to pitch for Team USA in the World Baseball Classic last March, meaning an abbreviated time in camp. LAKE BUENA VISTA, Fla. — Time will tell whether Craig Kimbrel will earn the right to one day be mentioned as reverently as Mariano Rivera, Trevor Hoffman and the legends who have previously set the standard for the closing role. But for now, Kimbrel can take satisfaction in the fact that he currently stands as baseball’s premier closer. Kimbrel added another honor to his portfolio when he was recognized as the Closer of the Year when MLB.com’s Greatness in Baseball Yearly Awards (GIBBYs) were announced on Tuesday afternoon. While Kimbrel might not have been as dominant as he was when he struck out more than half the batters he faced during the 2012 season, he still spent this past season proving to be one of the most feared closers the game has seen over the past decade. Kimbrel successfully converted 50 of his 54 save opportunities, including 40 of his last 41, this past season. The 25-year-old right-hander’s career-high 50 saves matched Jim Johnson for the Major League high. He became the youngest pitcher to reach 50 saves. MLB’s A-listers won GIBBY trophies — the ultimate honors of baseball’s awards season — on Tuesday at the Winter Meetings. More than 10 million votes were cast by media, front-office personnel, MLB alumni, fans at MLB.com and the Society for American Baseball Research. This year’s GIBBY Awards featured nominees in 22 categories. Individual honors went to the MLB MVP, in addition to the year’s best Starting Pitcher, Hitter, Closer, Setup Man, Rookie, Breakout Hitter, Breakout Pitcher, Comeback Player, Defensive Player, Manager, Executive and Postseason Performer. GIBBY trophies also were awarded for the year’s top Play, Storyline, Hitting Performance, Pitching Performance, Oddity, Walk-off, Cut4 Topic, Regular-Season Moment and Postseason Moment, with video available via MLB.com’s Must C highlight reels. GIBBYs categories included players from both leagues and performances not only from the regular season but also through the end of the playoffs, making them unique in singling out the best of the best. All 30 clubs were represented among the award candidates. In fact, every team had multiple nominees in 2013 — a testament to the parity of talent around the game. But after blowing a ninth-inning lead in both of those games, Kimbrel set a Braves franchise record by converting each of his next 37 save opportunities. Kimbrel stands as the only pitcher in Major League history to record 40 saves in each of his first three full seasons. He leads the Majors with 138 saves during this span. Johnson ranks second with 110.